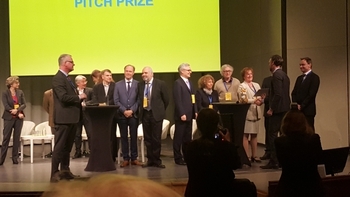 ITEA 2 project DIAMONDS won the prestigious EUREKA Innovation Award 2016 in the category ‘Added Value’ and the Project Pitch Prize during the EUREKA Innovation week in Stockholm on 27 April. DIAMONDS project leader Ina Schieferdecker received the award from Per Tervahauta, Chairman of the EUREKA High Level Group. 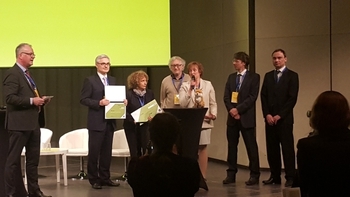 In the morning of 27 April, the ITEA 2 project DIAMONDS was announced as the winner of the EUREKA Innovation Award 2016 in the category ‘Added Value’. A winning project was announced for each of the three categories ‘Competitiveness’, ‘Added Value’ and ‘Innovators of tomorrow’. These three finalists then took part in a contest for the best project pitch, ultimately won by the DIAMONDS project. Zeynep Sarilar, ITEA Chairwoman: “We are proud of DIAMONDS winning the EUREKA Innovation Award 2016; another prestigious recognition. DIAMONDS increases the global security of our digital society, providing a full methodology for model-based testing for security weaknesses. These tools are already exploited the market in many different products and services”.